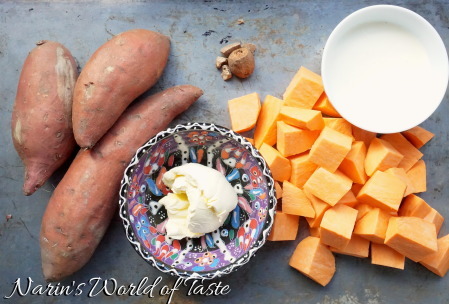 I love the taste of sweet potato, especially the darker-skinned variety with the thick and dark orange colored pulp. It has a hint of sweet with a moist texture. Sweet potato is low in carbohydrates, has a high nutrient density, and is source of certain vitamins and minerals such as Vitamin A and Beta-carotene. 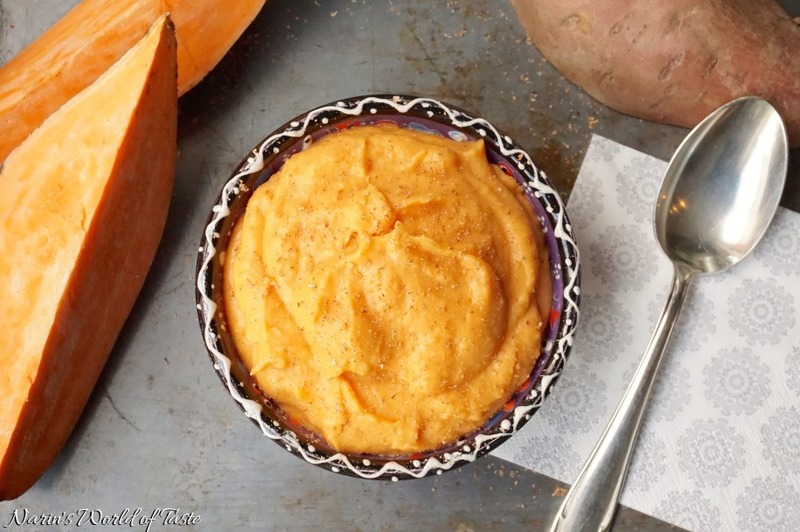 As a result, sweet potato is a great alternative for a healthy side dish. 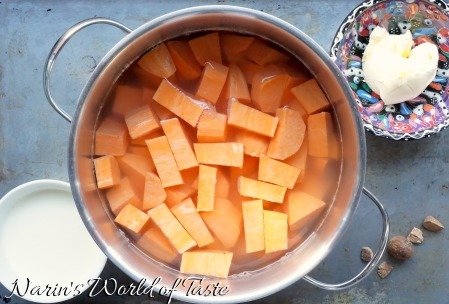 Peel the sweet potato, cut it into pieces, and cook in a pot with salt water until soft. This typically takes 20-25 minutes depending on the size of the pieces (you can test by piercing with a fork). Once cooked, pour the sweet potato into a strainer to drain the water. Now pour the cooked pieces back into the pot, add cream and butter, and puree everything with a hand blender until smooth and silky. Then season to taste with nutmeg and salt & pepper. To serve, if you have food forming rings, this is a great opportunity to use them. Else, use a normal table spoon and arrange nicely. This side dish nicely accompanies any kind of fish or meat, and I really like to serve it with Fillet of Beef on Mushroom Sauce.